Hytera America Inc. and Voceon Digital Radio Communications – leaders in commercial two-way radios – are coming to the rescue of Texas-based organizations affected by Hurricane Harvey and natural disasters in other locales. Press Release (ePRNews.com) - Houston, Texas - Oct 30, 2017 - HOUSTON – Hytera America Inc. and Voceon Digital Radio Communications – leaders in commercial two-way radios – are coming to the rescue of Texas-based organizations affected by Hurricane Harvey and natural disasters in other locales. Hytera and Voceon recently provided 50 donated digital radios and eight 6-bank chargers to the Texas Baptist Men organization (http://texasbaptistmen.org). These radios were dropped off by Voceon at the Houston operations headquarters of Texas Baptist Men, to aid the relief operations in the Houston area and other disaster areas. During rescue and recovery efforts, two-way radios are often used instead of cell phones because workers and volunteers can communicate with many relief teams across a broad area with just one click of a button. Transmission is clear and reliable. The Texas Baptist Men (TBM) organization has been involved in disaster relief in Texas and around the world since 1967, and currently are providing disaster assistance in hurricane-ravaged areas in Florida, Louisiana and Puerto Rico through the Southern Baptist Disaster Relief, which is one of the largest responders to catastrophes in the United States. In the Houston area, TBM and its partners are active at 11 sites with feeding, shower/laundry, heavy equipment, chaplains, childcare, chainsaw, temporary roof, flood recovery, box units and recharging stations. The organization is working together with the American Red Cross to prepare and serve 10,000+ daily meals for flood victims and relief volunteers. Thus far, Hytera America has donated $35,000 worth of equipment to local search and rescue operations, providing reliable digital radio communications in the aftermath of Hurricane Harvey. 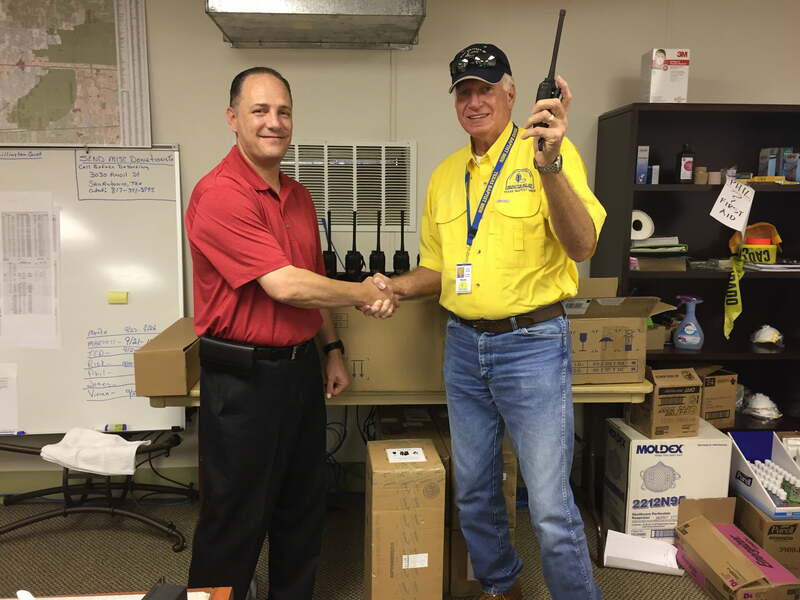 This is the second donation of two-way radios and equipment which Hytera and Voceon have made in the Houston area. Along with the donation of the two-way digital radios, Voceon and Hytera America are also offering a 40% discount off the MSRP as a trade-in credit for any organization that purchases new two-way digital radios, including those groups with water-damaged equipment. Special financing is also available. Rental radios will be provided at no charge to use until new Hytera radios arrive. To take advantage of these special emergency-driven offers, contact Voceon’s Houston office, located at 1219 Price Plaza Drive in Katy, TX 77449 or via phone at (281) 616-7244. To learn more about Voceon Digital Radio Communications, contact GM Joel Mills at 281-593-9093 or jmills@voceon.com. Information is also available at http://www.voceon.com. Additional details regarding Hytera America, Inc. can be found online at https://www.hytera.us. For more information about the Texas Baptist Men, go to http://texasbaptistmen.org. Moorgate Capital Partners Acquires ITC Service Group, Inc.